TurboCPU DAC/CV Option – New Parts Source? I made an interesting discovery on the web today. There are a lot of companies making “Breakout Boards” and “SMT to DIP Adapters” but I’ve never found an assembled one for the MCP4728 DAC used in the TurboCPU’s CV/DAC option … until today! I just ordered one assembled breakout board (DAC chip and pins installed) as well as just a blank board with machine pins. I will test them both out. If it all works out then this is a good place to order these parts from because making the CV Option is a major bottleneck for me. MCP4728 Breakout Board, chip included, assembled. MCP4728 DAC breakout board, unassembled, DAC not included. Part Number: PA0027, unassembled with machine pins, ROUND. A few things to note about this right up front. Since the beginning of 2014 I have added a second area on the TurboCPU’s MIDI board to put the DAC chip on. The original area is the tiny MSOP-10 footprint, the new area is a 10-pin DIP footprint. but this new discovery from Proto-Advantage is very exciting! Now, because I’ve also been installing a 10-pin DIP socket I think the round machine pins are the better way to go as I’ve never really liked the idea of jamming square wire-wrap pins into a DIP socket. 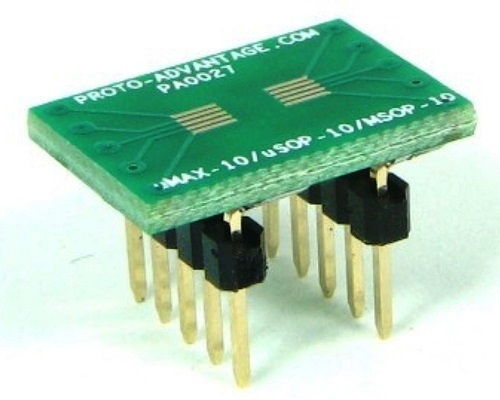 The other alternative is for me to leave off the DIP socket and just allow you to solder the Proto-Advantage fully assembled breakout board right on the PCB. Once I get these and test them out I’ll decide which route to go. This entry was posted in Pro One CPU. Bookmark the permalink. 2 Responses to TurboCPU DAC/CV Option – New Parts Source? I’m working on a Rev D version of this board that will remove the DAC SMD part completely and instead offer better support for the DAC daughter PCB. I will enlarge the holes to accommodate the Proto-advantage.com square pins and I’m going to run separate traces for the VCC and GND to the analog part(s). Finally I will add another 10uF cap and a 0.1uF cap near the DAC daughterboard.